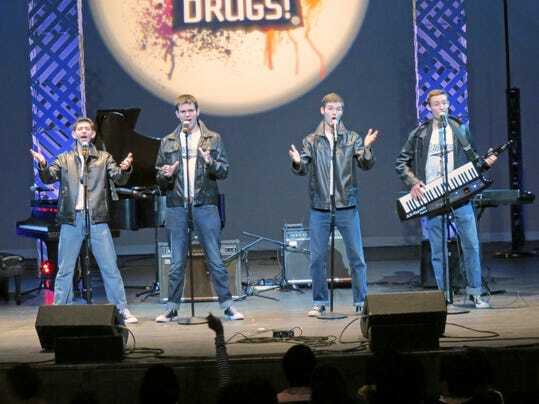 HANOVER – A quartet of talented teens from Whippany Park High School, who in three years have taken the oldies music circuit by storm, are now the unofficial ambassadors of anti-drug messages to the youth of New Jersey. The Whiptones — seniors Michael Mastellone, Derek Ritschel and Matt Korzen, and sophomore Bradley Ritschel — won a recent contest sponsored by the Partnership for a Drug-Free New Jersey. Their message can be summed up in five short words: Don't do drugs, doo-wop. "We want to thank all our fans for voting for us," said lead singer Mike "The Master" Mastellone. The group, which already has performed its old-school doo-wop and a capella music at the Izod Center, PNC Bank Arts Center and the big annual Lead East 1950s show in Parsippany, was named the winner of the Partnership's Shout Down Drugs Prevention Concert on May 21 at the New Jersey Performing Arts Center. "My father played a lot of old music in the house, and I just fell in love with it," Mastellone said. "It's simple, catchy and just fun. We started singing at Lead East and since then, we've had the pleasure of singing with some great singers like Jay Siegel of the Tokens and Gene Chandler (better known as the Duke of Earl). They've been great and have been huge supporters." Their winning entry in the contest, a song titled "Doing Drugs Ain't Dope," helped them best 31 other New Jersey high school finalists representing 14 counties and netted them a $5,000 performance contract. "Simply by being here tonight, these amazing teen musicians have affirmed their commitment to a healthy and drug-free lifestyle," said Angelo M. Valente, executive director of the Partnership for a Drug-Free New Jersey. "We are proud of each one of the participants and are always impressed with the level of talent in the state of New Jersey." The contest challenged high school students to create original music with lyrics that contain powerful peer-to-peer drug-prevention messages. The students competed for one of three music contracts with the partnership worth a total of $10,000. "The contract involves them singing at different events over the next year," said partnership media coordinator Matt Scuteri. The Whiptones have had a memorable spring. In addition to the contest at NJPAC, they beat out 150 other groups in another competition for the privilege of singing the national anthem prior to the Mets opening day game in April at Citi Field. "Oh, my gosh, it was amazing," said Derek "Ritz" Ritschel. "It was a rainy day, but luckily, the weather changed drastically before the game. It became a sunny day, and the seats were filled." A full summer schedule awaits them, beginning with a gig at Cousin Brucie's Palisades Park Reunion II on June 21 (at the State Fair Meadowlands in East Rutherford), sharing a bill with legends such as Neil Sedaka and Chubby Checker. They will return to Lead East in late August before the three elder Whiptones head off to college. The question from there is — facing college workloads and geographic challenges in the fall — will we see them in September? "We definitely plan to keep things going and, with modern technology, I don't see why not," Mastellone said. Fans can chart their progress, purchase their CDs and Whiptones gear and book them at www.thewhiptones.com. Staff Writer William Westhoven: 973-428-6627; wwesthoven@dailyrecord .com.